It’s almost incomprehensible to believe BC has had over 1100 fires and more than 300 buildings have been destroyed in wildfires this year. 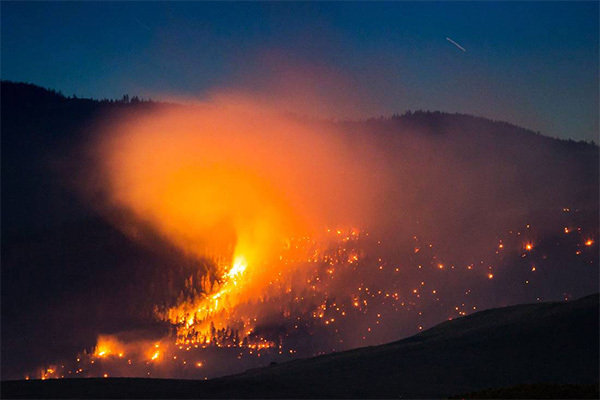 The wildfires have affected communities in the areas of Kamloops, 100 Mile House, Prince George, Cache Creek, Kelowna, Williams Lake and many others, burning more than 1,054,000 hectares, across our province. Many are facing loss, devastation and uncertainty as the wildfires continue to rage right here in our own backyard. Our neighbours, friends and families need our help now, more than ever! The International Day of Peace, known as “Peace Day” is recognized around the world on September 21, and provides a shared date for all of humanity to commit to living in peace and rise above all differences. We can all be a part of a huge ripple effect which will bring hope and relief to those who need it now. At The Flag Shop, we care about connecting with our community and in our daily work we bring peace and happiness through every relationship and every connection we make with others. It’s through these connections where we find our joy. We’ll be announcing our plans on Tuesday, September 5, which happens to coincide with the International Day of Charity. Stay tuned to our weekly blog so you won’t miss a thing. Be “in the know” and up-to-date on everything we’re doing by subscribing here. (unsubscribe at any time). Get ready to be a part of something bigger! And join us as we change the world one flag at a time! 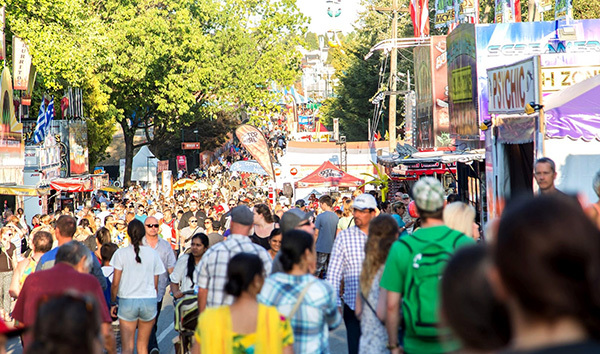 The Fair at the PNE is a long-awaited highlight of summer in Vancouver, offering activities and fun for everyone: Midway rides for adrenaline junkies, fair foods for the foodies, and a mind-boggling line-up of live musical performances, to name just a few. This year the fair runs from August 19 – September 4, with planned closures on August 21 and 28. 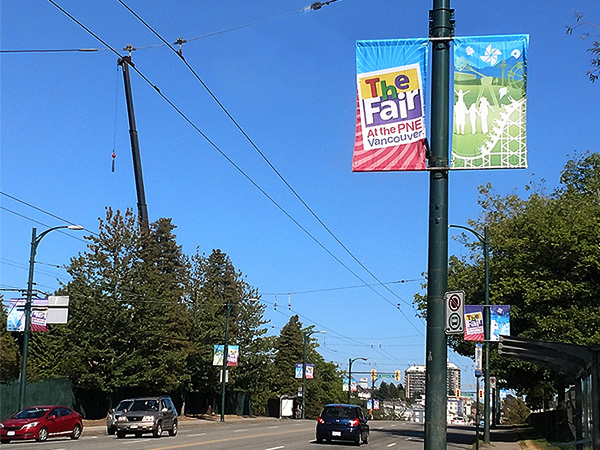 We have been supplying the PNE with street banners for many years, to engage and inform the public while creating anticipation about the fair. We love being a part of making our city streets, bridges and skyline even more beautiful. If you’re in the Vancouver area, you can see the banners for yourself on East Hastings and on the Granville Street Bridge. 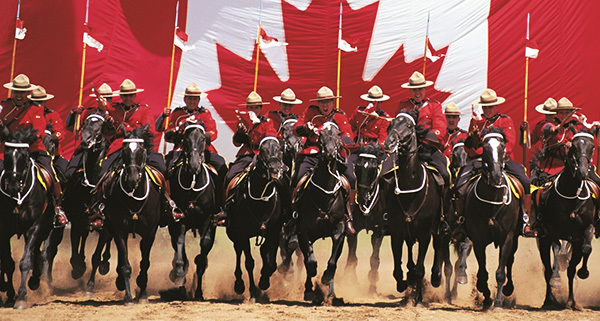 In recognition of Canada 150, the RCMP Musical Ride will perform at the fair as part of its Canada-wide tour. The musical ride has been a Canadian tradition since 1876. Mounties wearing the Red Serge ride a full troop of 32 black Hanoverian horses and perform precision drills reflecting the historic cavalry techniques that were once a part of RCMP training. The Hockey Hall of Fame’s Legends of Hockey Exhibit is a must-see for all hockey lovers. 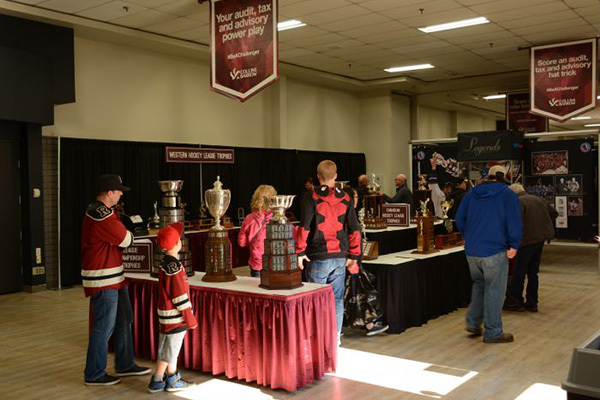 This massive exhibit will feature many of the game’s greatest players and hockey memorabilia including photography, video and artifacts. If you love the national winter sport of Canada, this one’s for you. If kettle corn, funnel cakes and beaver tails are more your thing, you won’t be disappointed. For those looking for something new and adventurous, how about cricket fries or deep fried Jello? Yum! For more information about the Fair at the PNE, please visit their official website. We’re still hearing inspiring stories of Canada’s 150th birthday. 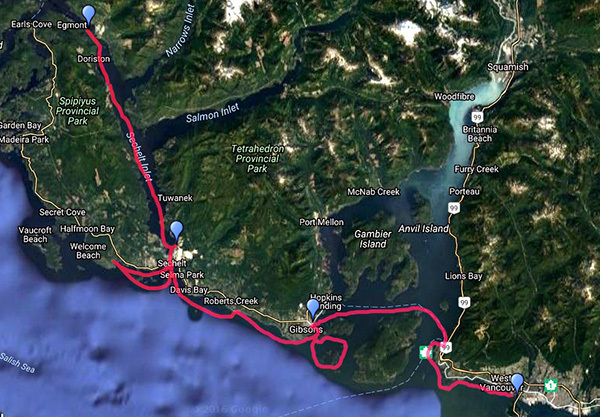 This week, we highlight the Sunshine Coast Canoe Journey, an epic trip planned by the Gibsons Paddle Club. The journey, which took place in June, honoured Canada’s 150th birthday, the canoe, and the First Nation culture of cooperation. And what a sight it was to see every canoe adorned with the Canadian Native Flag! 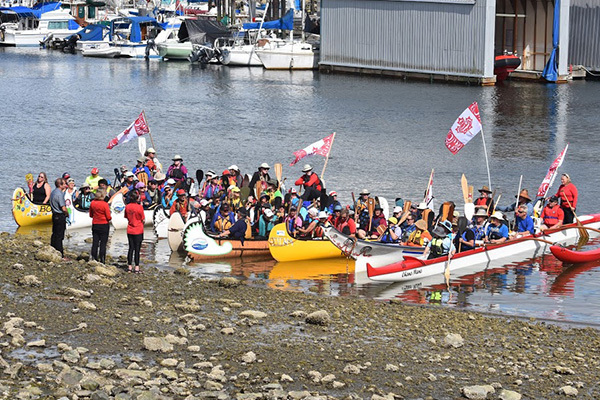 On June 13, nine canoes from across BC and Alberta met at the Backeddy Marina in Edgemont. Placing the canoes in the water, the group held their first of many circles. This is a tradition which has been passed down by generations of first nation paddlers. They told stories and heard drumming by Andy Johnson and Terry Aleck. On day two they paddled in the early morning drizzle through the calm waters of the Skookumchuck, as eagles flew overhead. The tide was with the team, who stopped for lunch on the Inlet. After a very windy afternoon, the team struggled to pull over to their campsite for the night. Sechelt elder Barb Higgins told stories, captivating the paddlers after a long day of paddling. Still rainy and windy on the third day, plans changed and the team paddled to Poise Island – sacred to the Sechelt Nation – and while there, they heard moving stories of illness and death at the time when they first encountered settlers. Hauling the canoes out of the water, they were welcomed by school children and teachers, who braved the rain to greet them. 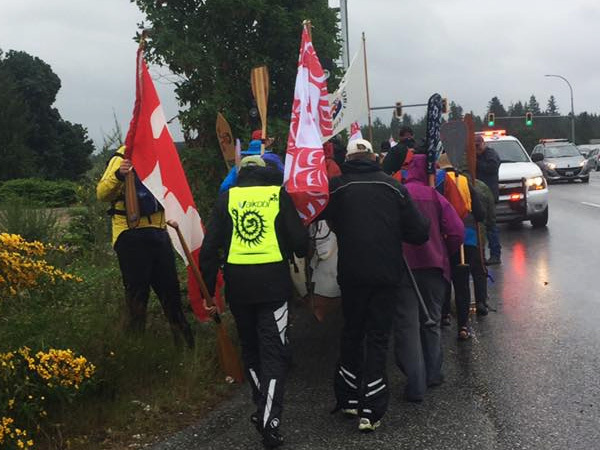 The team portaged their canoes across town, escorted by an RCMP patrol car. With the heavy downpour, the Sechelt band opened the daycare centre where they were able to take shelter. They spent the evening at the Sechelt Longhouse and were treated to a cultural celebration and feast. On day four, the weather improved and the paddling crews prepared for a long paddle to Gibsons. Stopping for lunch at Roberts Creek, the grandmothers prepared a lunch and a local ukulele band sang and played while the paddlers rested. After the long paddle the day before, the fifth day was a day of rest. Out of town visitors experienced the beautiful ocean playground, paddling around Keats Island and the Paisleys. Then they were off to the Jazz Festival and supper at Gibsons Public Market., It was a festive evening of good speeches, great food, and dancing! On the final day, crews paddled a long 38 km back to Vancouver. The weather was misty and cool and the tides and currents were with them. Finally, through the mist they saw the first buildings of West Vancouver. 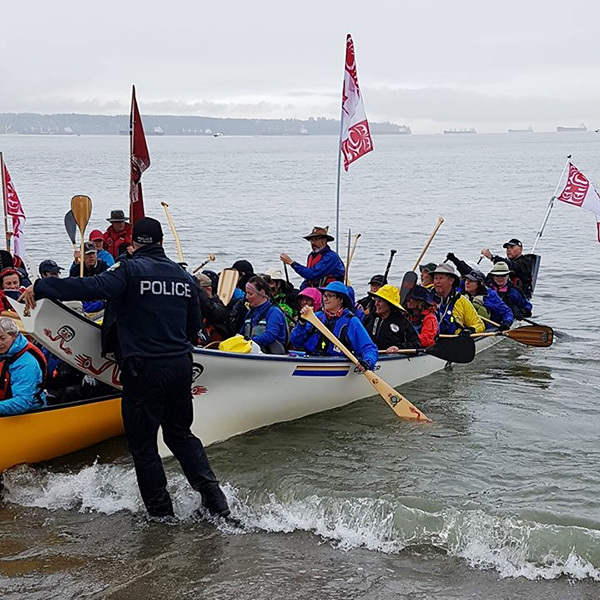 Wes Nahanee of the Squamish First Nation and the West Vancouver Police greeted the paddlers as the epic journey came to an end. Congratulations to the organizers and paddling crew on this important journey, paying homage to the people of our great nation, the canoe, and the first nation culture of cooperation. For more information, please visit Gibsons Paddle Club’s web site. Denman. Davie. Robson. Three Great Streets. One Amazing Neighbourhood. That’s right – One Amazing Neighbourhood! That’s thanks to the West End Business Improvement Association (WEBIA), an amazing non-profit organization supporting businesses along the West End’s three main commercial streets. Covering Davie, Denman and Robson, each street has its own designated colour highlighting its uniqueness. Denman is blue, reflecting the ocean and blue summer skies. Robson is green, symbolizing the greenery of Stanley Park. And Davie is purple, in recognition of Davie Village’s role in supporting the Gay Pride Movement. 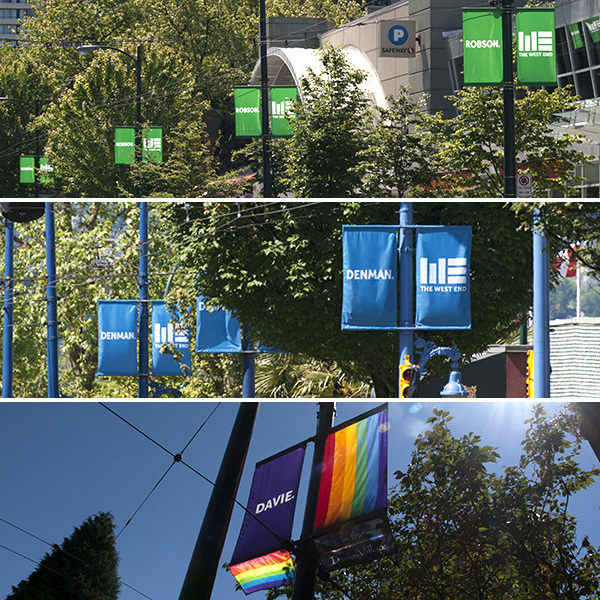 Speaking of Pride, it’s time to celebrate in Vancouver and we’re thrilled to be part of it all! The Flag Shop has been a supporter of the Gay Pride Movement dating back 40 years, when we first produced rainbow flags and decals for the San Francisco Gay Freedom Day Parade. We’re getting so excited about Pride Fest coming up this Sunday we’re even testing out our Pride booth in The Flag Shop parking lot! Join us on Sunday, August 6 at Sunset Beach from 11 a.m. – 6 p.m. We love this festival because it’s a safe place to celebrate individual uniqueness and self-expression, while at the same time it’s a collective expression against bullying, oppression and violence. We hope to see you at our booth where we’ll have everything you need to express your pride! 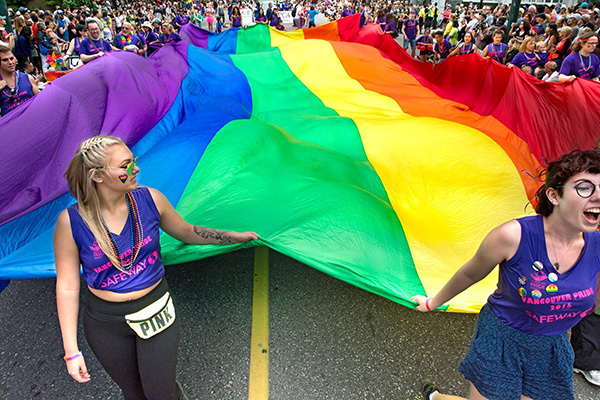 The 39th Annual Pride Parade is a huge part of Pride Fest and will run that day from noon – 3 p.m., starting on Robson, turning down Denman, and then onto Beach Ave. On Friday, August 4th, Davie Village will be the place to be for one of Vancouver’s best outdoor parties, the Davie Street Block Party. This week’s blog is a big shout out to the WEBIA, home to the best restaurants, stunning beaches, and of course, Pride! 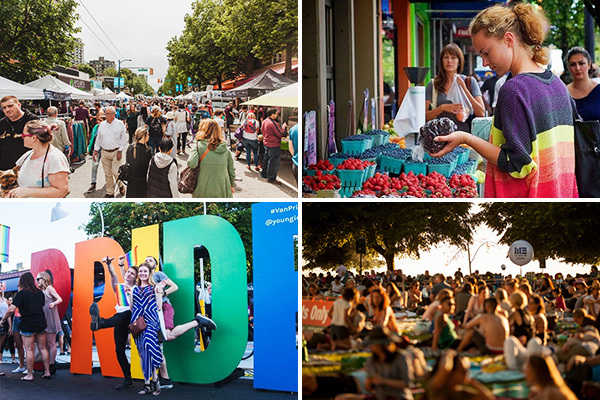 The West End attracts thousands of visitors to the area every year for the Pride Parade, so if you ask us, it’s pretty clear the WEBIA is doing a bang up job fulfilling its mission to promote and revitalize the West End. For more information about the West End BIA, and its Pride activations in the West End, please visit the WEBIA website. For information about Pride in Vancouver, visit the Vancouver Pride Society website. You are currently browsing the The Flag Shop Blog blog archives for August, 2017.